This aromatic, medium roast is sure to awaken your senses and follow with a smooth and bright finish. Made from only 100% select Arabica coffee beans. 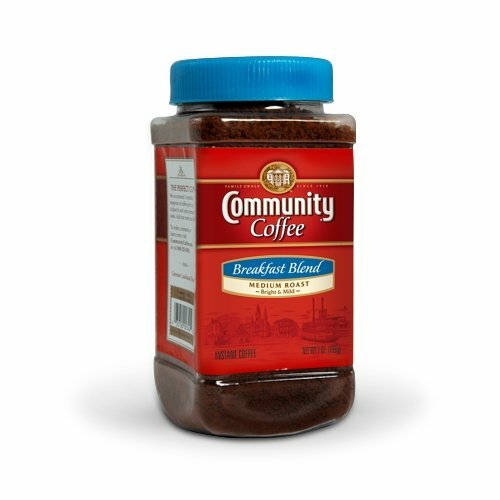 Enjoy 28 ounces of instant coffee. Enjoy the taste of our Breakfast Blend medium roast (medium full body, medium brightness, smooth and bright taste.) Perfect coffe and dessert pairings: enjoy Breakfast Blend with your creamy and tart desserts as well as fruit pastries and rich cakes and pies. 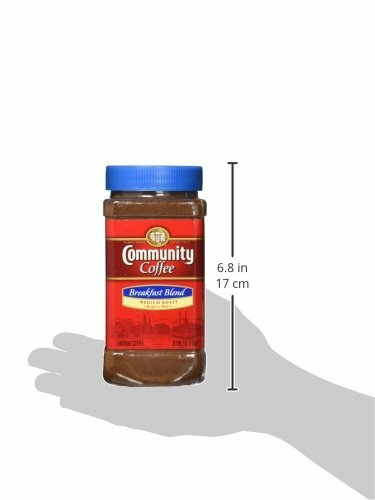 Breakfast Blend, ground medium roast coffee, also available in ground 12 ounce bag, 16 ounce (1 pound) bag and 23 ounce bag as Medium Roast, 32 ounce (2 lb) bag, 36 count and 72 count box single serve coffee pods (compatible with Keurig KCup brewers). Available in 12 ounce whole bean bag. You may also enjoy our medium roast Amber Sunrise Blend and other medium dark roasts from our gourmet coffee line: Private Reserve Founders Blend, and Private Reserve Colombia Toledo Labateca. The roast refers to the temperature which the coffee bean was roasted. The roast determines the flavor of the coffee. Light roasts are described as ‘sweet’ or ‘well-balanced’, while dark roasts are intense and lively. The body is the weight of the cofee on the tongue. It’s described as ‘syrupy’, ‘heavy’ or ‘buttery’. The brightness (acidity) refers to the tangy quality, liveliness or bright note that highlights the flavor of the coffee. Acidity is felt on the sides and back of the tongue. High acidity is described as ‘winey’, ‘bright’, ‘lively’, ‘sharp’, or ‘tangy’.SMOOTH & BRIGHT: This aromatic, medium roast is sure to awaken your senses and follow with a smooth and bright finish. Made from only 100% select Arabica coffee beans. Enjoy 28 ounces. FIND YOUR PERFECT BLEND: A blend for every taste; medium roast Breakfast Blend for a perfect morning, Coffee & Chicory (a New Orleans tradition) for an afternoon perk, an evening cup of Signature Dark or Decaf for a treat. MAKE IT COMMUNITY: Community Coffee is dedicated to giving back to the communities we serve with passion for ensuring everything we do is as good as our coffee through sustainable coffee bean sourcing, giving back to single-origin coffee farms, military and education. HINT OF FLAVOR: Flavored coffee fan? Try Pecan Praline, French Vanilla, Hazelnut, Mardi Gras King Cake coffee, or seasonal: Sugar Dusted Beignet, Spiced Pumpkin Pecan Pie, Dark Chocolate Peppermint in ground or single serve (for Keurig K-cup brewers). JUST HOW YOU LIKE IT: Single-serve coffee pods (k cup compatible), whole beans for your coffee bean grinder, coarse ground coffee for a French press, ground coffees for every coffee maker or steep overnight for cold brew or iced coffee.